Category: Best Sellers Range, Birthday Range, Congratulations Range, Corporate/Reception Flowers Range, Flowers for Mum, Just Because Range, Romantic Range - Flowers for St Valentine's Day, New Baby Range, Thank You Range. 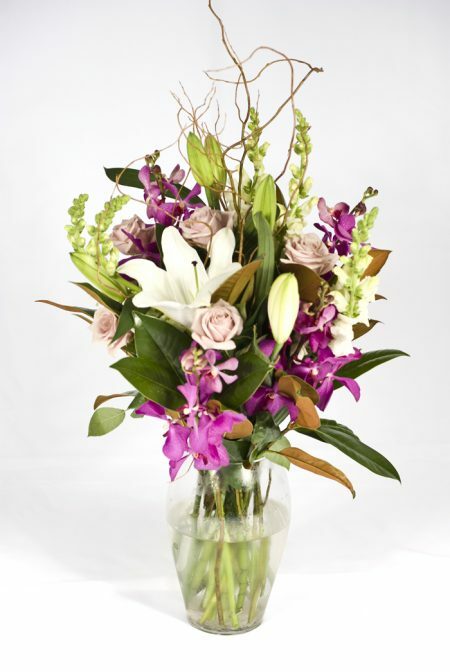 A beautiful display of Lilies, Roses, Orchids and Snapdragons in a Glass Vase. The recipient of this would be very happy. A cute and fun arrangement of Lilies, Roses and Alstromeria. Send a big congratulations to the proud new parents.